Because the voting is now open for the youtube orchestra, you can actually listen to the auditions, just as one day YOU might be listened to in an audition. click VOTE - then click orchestral audition - select "flute" or "piccolo" from the seating plan graphic - select one of twelve videos of finalists. Jen says: Wow! Isn't it amazing to be listening rather than being the flutist for a change? Sit back and really observe, eh? Finally we can see from the judge's point of view. Haven't you always wanted to know what an orchestral committee see and hear when a flutist auditions? For these youtube orchestra auditions there are a total of twelve flutists you can listen to and vote for at the youtube orchestra channel: I felt these two had very strong visual and audio presentation. Interesting to learn from sitting in the judge's seat. For example: Listen to the two players below and conduct along or tap the table, listening to the orchestral part in your mind. Which player feels metronomically alert? Rather than film her audition in several takes, this participant above played all the excerpts back to back; now that's raising the bar!! And of interest also is the "lyrical improvisatory" section of the contest. Love the veritasse background of kitchen! 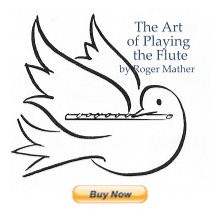 Enjoy and join me in learning what makes a great audition for a flutist. I enjoyed Marco and Jennifer's performances, too. Very well done! Hi Jen B. fabulous improviser. I personally LOVE the fact that your lyrical improv. is done in your kitchen. We all know that there are certain practice spaces in our houses that are fabulous for flute. These would be the non-fabricy, echoing spaces, like kitchens and bathrooms; and the higher the ceiling the better. In 2005 at a masterclass, Sir James Galway brought his recording engineer (of 25 yrs.) up on the stage to answer questions about recording "the Galway sound". Immediately, the engineer said: "We find a wood paneled hall with the best possible flute sound, and we place a microphone where it picks up the natural sound the best." I believe all three videos above did this. They are the best sound and presentation available for each player on the day that they auditioned. Well done!